The Figure above illustrates a theoretical three dimensional landscape where acceptance of evolution is depicted as function of religiosity, science awareness, and evolution literacy. The point zero corresponds to low/none personal religious convictions, understanding how evolution works, or understanding of the essence of science; zero is a no awareness corner, with low probability of occurrence (LPC). The tips of the coordinates’ arrows correspond to a high/deep religiosity, evolution, or science awareness. 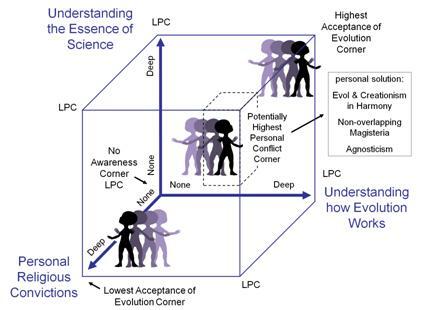 The highest acceptance of evolution corner (top right) is characterized for its low religiosity and high/deep evolution and science awareness. The lowest acceptance of evolution corner (bottom left) is characterized by its high religiosity and low evolution and science awareness. A potentially highest personal conflict corner resides at the intersection of high or deep religiosity and evolution and science awareness; this conflict condition can be resolved by the individual adopting comforting positions, such as: evolution and creationism are in harmony, non-overlapping magisteria (= science and religion occupy separate domains), or agnosticism (doubt about the existence or nonexistence of a deity). Other corners are also labeled LPC due to their low probability of occurrence. Adapted from Paz-y-Miño-C & Espinosa. 2012. Why People Do Not Accept Evolution: Using Protistan Diversity to Promote Evolution Literacy. J. Eukaryot. Microbiol. DOI: 10.1111/j.1550-7408.2011.00604.x. Silhouette of “people” in figure above comes from Dwarf Labs Com –used here for education purpose only. The controversy evolution vs. creationism is inherent to the incompatibility between scientific rationalism/empiricism and the belief in supernatural causation. To test this hypothesis, we conceptualized a Cartesian landscape where the dependent variable acceptance of evolution was plotted as function of three factors, each represented by an index (value range 0 to 3): Religiosity Index (RI), Science Index (SI), and Evolution Index (EI). The indexes summarized an individual’s personal religious convictions, familiarity with the processes and forces of change in organisms (= concept of evolution), and understanding the essence of science (= method to explore reality). We compared and contrasted acceptance of evolution among four populations of variable educational attainment: 244 professors of New England, United States (93% Ph.D./doctorate holders), 50 protistologists from 25 countries (70% Ph.D./doctorate holders), 62 educators of prospective teachers (83% Ph.D./doctorate holders), and 827 college students. The New England faculty held the highest acceptance of evolution position (RI = 0.49; SI = 2.49; EI = 2.49), followed by the protistologists (RI = 0.46; SI = 2.30; EI = 2.48), the educators of prospective teachers (RI = 0.83; SI = 1.96; EI = 1.96), and the students (RI = 0.89; SI = 1.80; EI = 1.60); therefore, the data supported our hypothesis. Proper science education, public outreach and robust debate over the controversy “evolution versus creationism” should suffice to improve society’s evolution literacy, and qualified scholars ought to lead this mission. — Paz-y-Miño-C & Espinosa. 2012. Why People Do Not Accept Evolution: Using Protistan Diversity to Promote Evolution Literacy. J. Eukaryot. Microbiol. DOI: 10.1111/j.1550-7408.2011.00604.x. Back to Evolution Literacy website.